I promised you some pictures, so here they are. After looking at these pictures, you may want to set your alarm nice and early to make sure that you score one of these bags! Here's my table display at the Blim show last Sunday. Supposedly, it wasn't as busy as April, but it still brought quite a few people out. Amy from Down Home Amy was my table mate. Her items are so cute! Go check out her etsy shop! 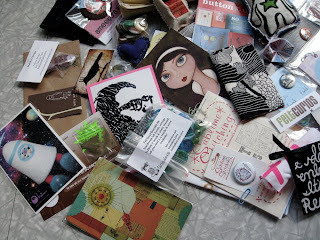 Got Craft is this Sunday and I am hoping to post some swag pictures tomorrow! Praying for sunshine and blue sky for Sunday and hoping for the post office to bring me the Moneris machine that is supposedly in the mail. Have to make a trip to Staples tomorrow to pick up the cool vendor passes we made up this year and will spend the afternoon assembling those. Other than that, things are coming along nicely. We had a nice post on Scout Magazine as well as Style Finds plus a little something something in the Westender that is coming out this Thursday. 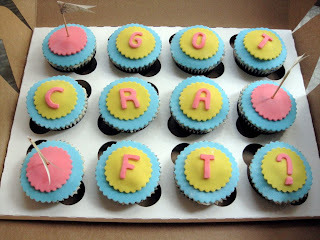 Did I mention that Got Craft is turning 3 this May? To celebrate, I just ordered a few dozen mini cupcakes from Coco Cake Cupcakes for the show. W00t! 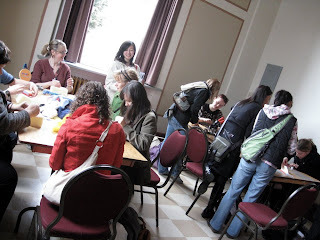 Learn how to needle felt with Stephanie from Fibre Manipulator! Register early! Space is very limited. $25 in advance and $35 at the door. Ages 10+, all levels welcome. 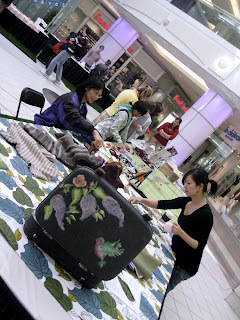 Register by emailing vancouvercraftmafia(at)gmail(dot)com your contact information. 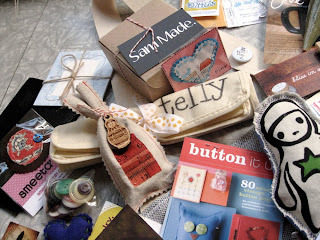 Lots of crafty things to do this Sunday. Check this out! I will be at this show, so come by and say hi! 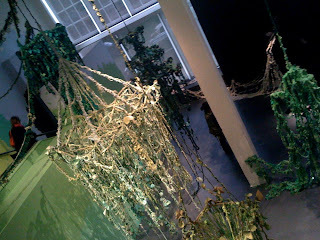 For more information, please visit blim.ca. 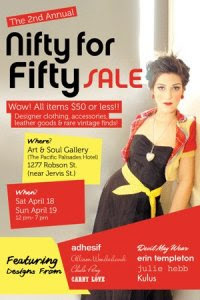 Little Miss Vintage Spring Cleaning Sale! 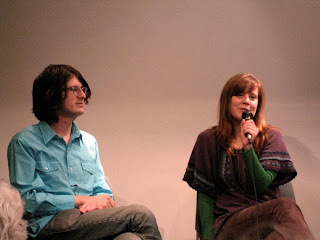 For more information, please visit portobellowest.com. 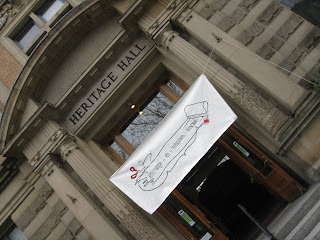 ... and don't forget that GOT CRAFT is next Sunday, May 3rd at the Legion on Commercial Drive from 11 am to 5 pm!!! Just a friendly reminder that swag items are due today for the Got Craft event on May 3rd. 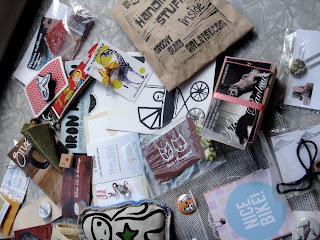 Some sneak peeks of swag items from little red caboose. Make sure you get there early. 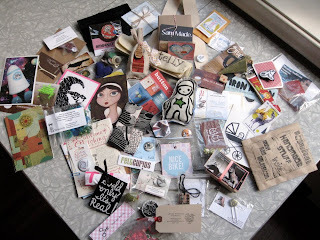 First 30 people through the doors receive a free handmade swag bag full of goodies such as this. People have been known to line up 2 hours in advance for one of these bags! Yummy cupcakes baked by the wonderful Lyndsay of Coco Cake Cupcakes. If you have never tried one of these little tasty morsels (what's wrong with you? 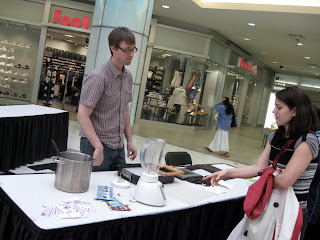 ), Lyndsay will be at the Blim Market this Sunday at the Cambrian Hall from 11 to 5pm. a BIG thank you to J & C!!!! 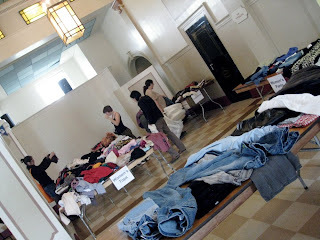 Swap-O-Rama-Rama took place yesterday and it was so much fun! 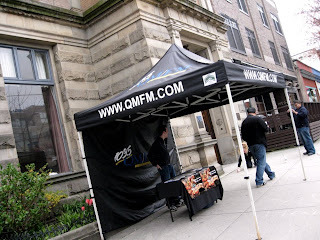 QMFM Street Team was broadcasting live at "the" event in town. Still recovering from all of the festivities, so I am keeping this short with lots of images! 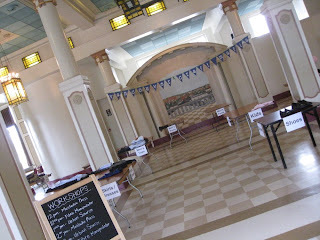 Before the doors were opened. 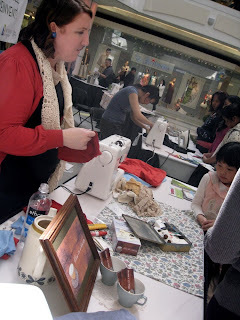 DIY sewing stations where experienced sewers can teach and guide you to transform your new finds. 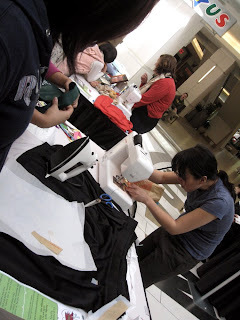 Some examples included napkins made out of pants and a pair of jeans were transformed into a skirt! 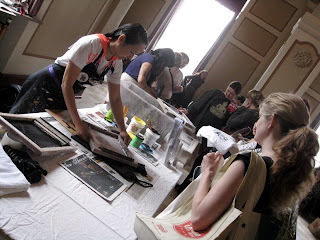 If sewing wasn't your thing.. then bring your finds to Blim and have them silk screened! 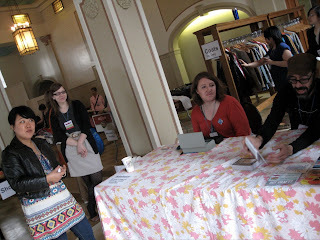 Check out Julie, Lia, Becka and Richard at the front desk! 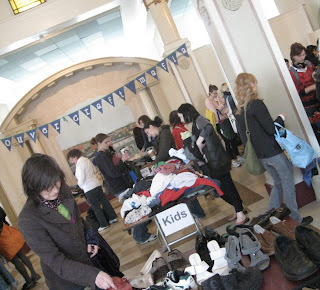 Ready to take your $$, stamp your hand and sort your clothes! 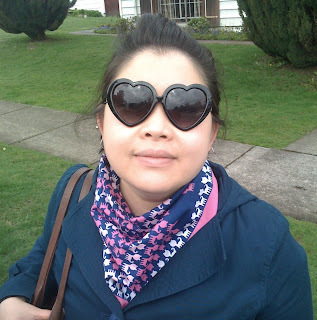 Me with my 'new to me' scarf. SCORE! ...and Robert as Paper Boy. 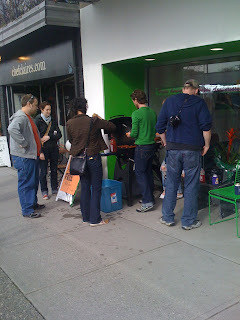 After the Earth Day event, we headed over to check out Foux De Fu-Fu over at the Cambrian and somehow ended up on Main and 20th for free hot dogs and pop? W00t! 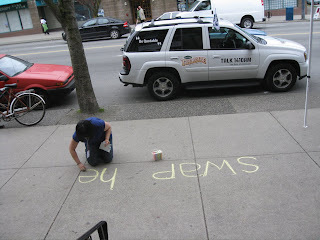 Thanks to Vancouver Special for the tasty treats! Ok, get out your calendar and mark this down! 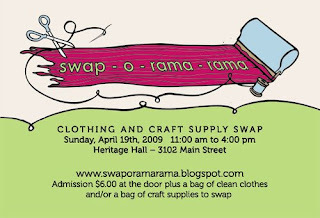 Swap-O-Rama-Rama is a community clothing and craft swap event. 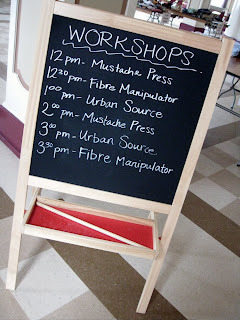 Workshops starting at noon by Blim, the Mustache Press, Urban Source and Fibre Manipulator. 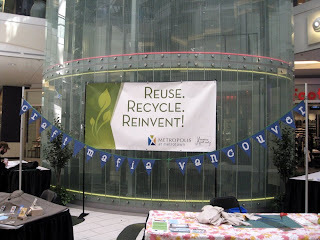 Learn how to silk screen, make your own buttons, needle felt and craft with recycled materials. 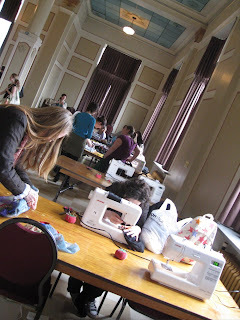 Including DIY craft and sewing stations. This event is a 2 part event. Local artists will be showcasing their work, giving the community an opportunity to meet new up and comers as well as purchase their work. This will be a lively day with music pumping, a bar open as well as many other random seeming activities to take place. 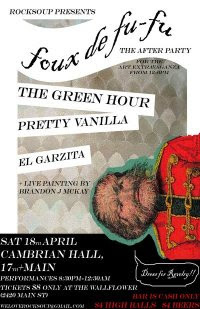 Live music including DJ El Garzita, The Green Hour and Pretty Vanilla; a full bar serving cheap drinks and a chance to rock out with your friends and soon to be, fans. Tickets are $8 and available at The Wallflower at 2420 Main Street. Update: The post and full tutorial can be found on Granville Magazine! 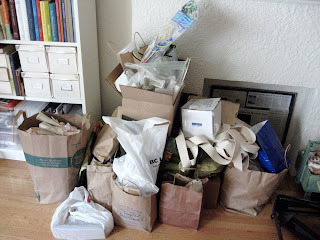 I was asked to write a tutorial for fusing plastic shopping bags together to make a bag, so of course, without ever doing this before, I said "Sure!!". So, viola, my first zipper pouch made completely with a zipper and fused shopping bags. Not only is it environmentally friendly, but it is waterproof too! After some trial and error, it was third time lucky. 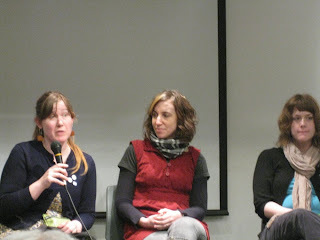 I forgot to show you this link of us on the Museum of Contemporary Craft's flickr page. DIY accessories courtesy of Blim and Track and Field Designs. Today's post includes a few snapshots of my favourite places in Portland. 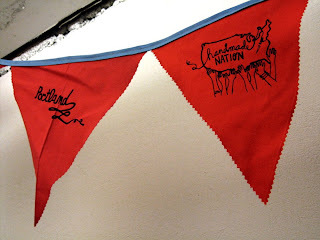 Check out West Coast Crafty for more images of the flag making process. 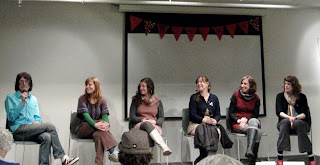 Back to the Museum of Contemporary Craft for the CraftPerspectives Conversation: Handmade Nation with Susan Beal (West Coast Crafty, Susanstars), Jill Bliss (Blissen), Kate Bingaman-Burt (Obsessive Consumption), Betsy Greer (Craftivism) Garth Johnson (Extreme Craft) and Faythe Levine (Handmade Nation). 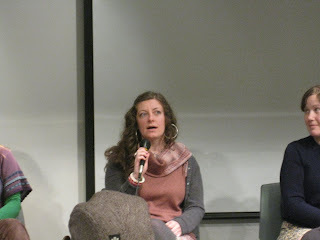 Moderated by Namita Gupta Wiggers, curator, Museum of Contemporary Craft. Some topics included feminism and crafting, participant backgrounds and where they came from, challenges of being judged when they don't buy handmade, permission giving, crafting - a fad or will it last.